My friend Ann on last year’s trip. God is working in my life in a powerful way, and I wanted to share a little of my story with you. Brandon and I have been planting Grace Hills now for two years, and God has been so faithful. We love our church, our community and most importantly, seeing people far from God coming to know Him. This November, a group from Grace Hills is going to Honduras on a short-term mission trip, and I have the opportunity to go. Going on a mission trip has always been a “someday” wish of mine, and having Drew this year seemed to push it even further into the future. But as I prayed, the Father made it clear to me that His will is for me to go this year. I am excited about this adventure, as well as being a little scared. 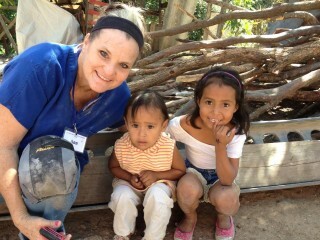 I become easily overwhelmed when I hear about the Honduran people. I’m praying daily that God would further break my heart with love for the people of this nation. Honduras is the second poorest country in Central America. Two-thirds of all children are malnourished and lack access to basic needs such as clean water, adequate shelter, medical care and education. Our short-term mission trip will not cure their poverty or provide them with those basic needs long term, but we can give them the greatest gift mankind has ever known… Jesus, and this is my greatest desire. I want to go out of a desire to care for the poor, especially orphans (James 1:27); to be a fisher of men and share the gospel of Jesus Christ with the lost (Mattthew 4:19) and out of a deep sense of accountability before God as to how I meet the needs of others (Matthew 25:31-46). I need your help. I need your prayer most of all. The Father has chosen to communicate with his children through prayer, and He invites us to make our requests known to Him because He hears our cries. Would you pray now for the Honduran people that I will meet? Pray that their hearts are softened and that they will be receptive to the life changing message of Jesus. Pray also that I will have courage to leave my 3 kiddo’s behind for a week, to lead well as I go with 19 other servants from Grace Hills, and courage to unashamedly share Jesus. I’m so thankful for you and I look forward to updating you. Thank you in advance for loving me and praying for me. So maybe it’s not always sunny in California, however it’s pretty amazing most of the time. I have spent some time on my blog reflecting on the difficulty in adjusting to our move to SoCal and wouldn’t you know it, just as I’m really settling in, God is calling our heart’s “back home” to Arkansas. I wanted to just take a few minutes and share the things I really love about our current home and ministry. Saddleback Church – It is hard for me to describe how I feel about this community of believers. Being part of this movement has been one of the most unbelievable experiences of my life. To think that God loves Brandon and I so much that he would “pluck” us up out of Arkansas and place us here to learn from some of the most influential leaders in the world is amazing. I know that our time here has been a gift and am determined to not waste what God has given us. I am not the same person I was a year ago-much of that is due to the influences of this church, especially fellow pastors and wives that have come along side our family to love us and encourage us. God has his hand on this church and her leaders and to be a part of it has simply been spectacular. The Weather – I have to admit the thought of returning to the heat and humidity has me a little sad. I will miss the constant sunshine and sweet breezes. I completely understand why so many people choose to make SoCal home despite the high cost of living. Adventure – Their is always something new to discover or explore. We have experienced endless possibilities of places to shop, swim, hike, explore. We live halfway between San Diego and Los Angeles and 5 miles from beautiful Laguna Beach. It’s easy to adopt a “beach bum” mentality here, and I like it! No Bugs – Seriously, I’ve seen a couple. We leave our doors and windows open year round and their are no fly’s or mosquito’s. It’s a beautiful thing! Small Group – My experience of what it means to live in community has been expanded due to these great families. Brandon and I have learned from them and been loved on by them. As we prepare to plant “Grace Hills” we know that we have 3 incredible families committed to praying for us. They know our hearts and see our flaws and love us anyway. We are grateful they welcomed us in and we will be better “church planters” because of them. Staying at home-This past year I have had the double blessing of being at home with both of my babies. I have been able to take care of little Sam, watch him grow and be a part of the day to day nurturing of our little man. I don’t take this for granted as I know there are many mom’s out there who must hold down a full-time job while being a full-time mom. When Ella was a baby, I worked outside the home and so I recognize the gift I have been given this past year. I also was able to stay at home with Ella and home school her this year. It has been a joy (most of the time)! The real delight has been in seeing her interact with her baby brother-they have a sweet bond that I pray will last forever! When we return to Arkansas, I will be returning to work and Ella will be returning to school (Life Way Christian School). I will cherish this time I had with them always! This list could go on and on. I really do love the life God has given us here. He has been so good to give us exactly what we needed. He shook us up and refused to let us be “comfortable” in ministry. This move to California has instilled in us the value of taking risks for the cause of Christ. I’m so ready for what’s “next”….but I’m gonna enjoy every minute of the “now”! In case you missed our big announcement…I’m posting the link (from Brandon’s blog). Brandon and I are humbled at God’s leading in our lives and excited about His plan. You can be sure I will be posting more details about Grace Hills Church in the coming weeks and months. If your a church planters wife…wow, I would love to connect with you! We need your prayers and I’m thanking you in advance for your love of my family as we follow God on this amazing adventure!